Does Ricoh's retro styled high end compact stand-up to the competition? Our test of the Ricoh GR IV is on the way, but in the mean time we would like to share the resolution chart images and the noise and dynamic range results. 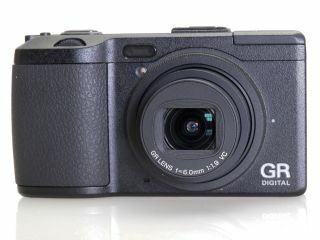 The GR IV is the latest in Ricoh's GR compact camera series and it was announced in September 2011. Priced at around £450 it features a 10 megapixel 1/1.7 CCD sensor, a fixed 28mm (equivalent) f/1.9 lens, and an improved LCD screen. Our results from the lab for the Ricoh GR IV have been compared against the Samsung EX1, Canon PowerShot S100 and Fujifilm Finepix X10, high-end compact cameras from their respective manufacturers. Our analysis shows that the GR IV produces good results for both signal to noise ratio and dynamic range from it's JPEG files, but compared with the competition the raw files lack dynamic range and can be prone to noise at the higher end of the sensitivity scale. As part of our image quality testing for the Ricoh GR IV, we've shot our resolution chart. If you view our crops of the resolution chart's central section at 100% (or Actual Pixels) you will see that, for example, at ISO 100 the Ricoh GR IV is capable of resolving up to around 20 (line widths per picture height x100) in its highest quality JPEG files. Read our full explanation of what our resolution charts mean. We shoot a specially designed chart in carefully controlled conditions and the resulting images are analysed using DXO Analyzer software to generate the data to produce the graphs below. For more more details on how to interpret our test data, check out our full explanation of our noise and dynamic range tests. JPEG images from the Rioch GR IV are on a par with those from the Samsung EX1 up to around ISO 400. Across the sensitivity range Ricoh GR IV TIFF images (after convesion from raw) have poorer signal to noise ratios than the Canon PowerShot S100, and Fujifilm X10 but they closely compare to the Samsung EX1 at the higher end of the sensitivity range. Across the sensitivity range TIFF images (after conversion from raw) from the Canon PowerShot S100, Samsung EX1 and Fujifilm X10 all produce higher results for dynamic range, showing the tonal detail can easily be lost especially at the higher end of the sensitivity scale.